Celebrate Australia Day with Broken Head Holiday Park!!! 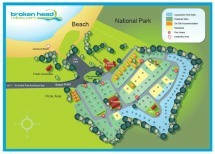 You are here:Home » Blog » Festivals & Events » Celebrate Australia Day with Broken Head Holiday Park!!! On Thursday the 26th of January the nation celebrates Australia Day. Australia day is about getting your family and friends out for a day of Aussie fun, whether it is backyard or beach cricket, having all the family over for lunch or just a great catch up. As you all know if you go to the local parks someone else has beaten you to the best spot. Here at Broken Head Holiday Park you don’t have to worry about anything. Our park is located right on our secluded beaches so you can have a big game of beach cricket with everyone. Otherwise there is a big grassy park with a few swings just next door great for a little footy match with the mates. Better yet rent a site or a cabin and the parents can relax while the kids are running around having a blast. After a tiring game of cricket put some sausages on the barbeque to satisfy everyone’s hunger. So come stay with us at Broken head Holiday Park this Australia Day weekend for a fun filled weekend and embrace your Aussie side.